On March 19, 1970, the Maryland State Police solidified their place in history when they performed the first aeromedical transport of a critically injured civillian. Since then, the Aviation Command has provided medevac and law enforcement services to the citizens of Maryland. The Maryland State Police currently operate out of seven strategically located bases. Their flight paramedics receive some of the most advanced airway training available and form the backbone of a time-tested and valuable trauma trauma transport system. Emergency medicine residents can schedule flight time with the Aviation Command during their EMS rotation. Dr. Doug Floccare, on faculty at the University of Maryland School of Medicine, is the state aeromedical director. Dr. Floccare provides medical oversight and training to the flight paramedics. Interested residents may also participate in flight paramedic education during regularly scheduled International Trauma Life Support and continuing education courses. Medical students are encouraged to tour the base of operations, participate in clinical education, and interact with flight paramedics. Currently, medical students who are not concurrently credentailed as EMS providers are not permitted to participate in flights. 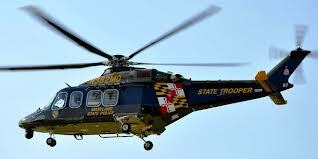 The Maryland State Police Aviation Command recently took delivery of newer, larger August AW-139 helicopters. These helicopters enable the Command to continue fulfilling their multi-mission purpose. State Police helicopters, in addition to providing trauma medevac services, assist with law enforcement activities, search and rescue missions, and convey remotely located victims of STEMI and stroke to definitive care facilities. The AW-139 platform accomodates 2 pilots, 2 patients, and additional crew members.